Eleven years ago, I walked into my local animal shelter, the SPCA of Wake County, to volunteer by caring for adoptable rabbits. Having had them as a pet throughout my childhood, I thought that I was well-versed in rabbit care. However, as I soon found out, so much had changed; namely, most rabbits are easily litter-box trained and prefer to live inside the house with their families and not in a hutch in the backyard, and, most importantly, they need lots of enrichment. In fact, with just a bit of bunny-proofing, most homes can be set up as a safe - and fun - space for your rabbit. As my formerly “hutch” rabbit Madeline can tell you, snuggling in cozy blankets inside is a great way to spend your day! Which Rabbit is Right for Me? From photos to videos to memes, the internet abounds with adorable rabbits. With breeds ranging from the tiny, two-pound dwarf to the giant English Lop, it is easy to fall for their cuteness. However, resist temptation and meet a few different bunnies first. Take a trip to your local shelter or rabbit rescue where you can get a sense of their personalities, which vary just as much as those of cats and dogs. If you want a “lap bunny” who just sits down and lets you pet him/her, you may be disappointed. Though they exist, since rabbits are prey animals, sitting in a human’s lap doesn’t come naturally and scares many of them. I’ve found that most rabbits love to lay beside me and get petted on the head, back, and ears – when they are not hopping around and exploring, of course. I have three rabbits with three completely different personalities, but they all love to be snuggled and crave affection and attention. They are curious and clever creatures that are far from being just cute. Another consideration before bringing a bunny home is that they are not low-maintenance pets. In fact, they can live to between 8 – 12 years with proper veterinary care by a rabbit-savvy veterinarian. Rabbits often hide illness, so annual visits are a must. Initial costs can range from $250-$300, including a large cage or x-pen, flooring, grooming tools, a carrier, litterbox, and bowls. 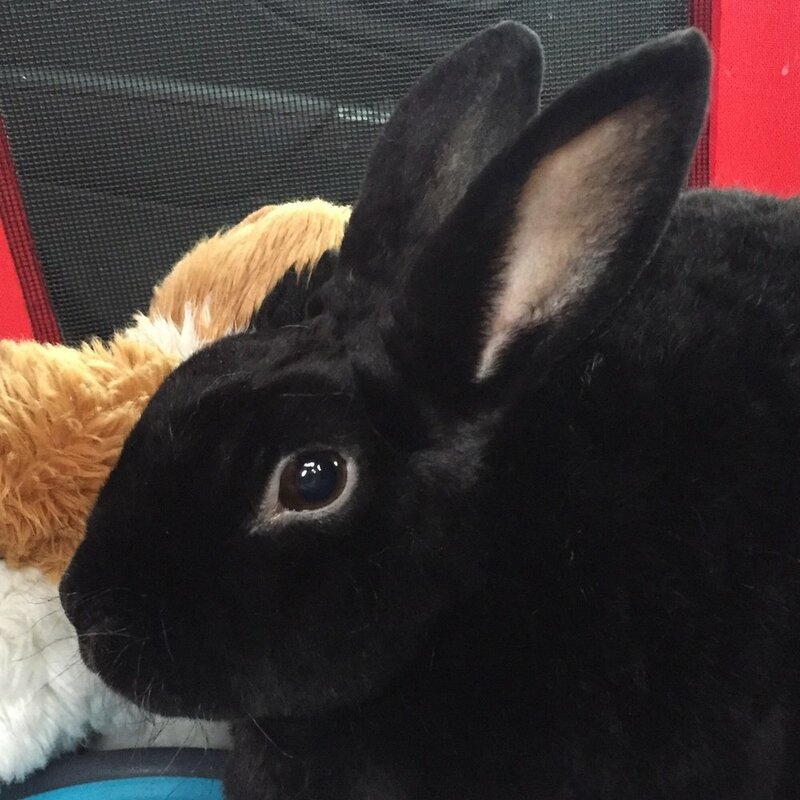 Annual costs of rabbit ownership are about $1000 when factoring in wellness vet visits (excluding emergencies) and $80 monthly costs (like hay, which makes up about 85% of their diet). Most rabbits adopted from rescues are spayed or neutered, which is essential to maintaining their health (and helping to prevent cancer in older female rabbits) and makes it far easier to litter-box train them. Additionally, having a fixed rabbit makes it easier for you to bond him/her with a rabbit friend. Rabbits are social animals, and most rabbits enjoy having a companion. My rabbit, Mr. Belvedere, is the “greeter” in the house and attempts to befriend most of my foster animals. He truly is a social butterfly. Once you’ve brought a new rabbit home, it is important to give her time to acclimate. You can find excellent examples on setting up a safe, large enclosure and play area for your rabbit from the House Rabbit Society, and our own local house rabbit education and rescue group, Triangle Rabbits. Cords, cables, and carpets tend to attract bored bunnies who need something to chew on, so you should bunny-proof your rabbit’s space to avoid trouble. The good news is that there are plenty of low or no-cost alternatives to these items that provide your bunny with something to chew, shred, or dig in; brown paper bags from the grocery store, a cardboard box filled with newspaper, and a phone book (yes, they still make them!) are some favorites. Enrichment is my favorite topic, and finding your rabbit’s favorite playstyle is a great way to bond with her. On my rabbit Samantha’s first night at my home, I placed different types of toys in her cage to find her preference. She chewed on all of them, but she also found a spot of carpet that she liked to dig up, too! Rabbits love to tear, dig, pull, and chew, so it’s best to get toys that will allow them to exhibit those behaviors – and to cover your carpets. They also like to push or throw things, so I often find a favorite toy in their water bowl. When I discovered that many bird toys are also safe for rabbits, I started making my own small animal toys to donate to shelter rabbits, which then blossomed into a side business called Bunderland. Rabbits and other small animals at the shelters where I volunteer are some of my best toy testers, and I’ve found that giving them toys (and sometimes bribing them with treats) is a great way to befriend a shy rabbit. February is “Adopt a Rescued Rabbit Month”, so now is a great time to consider adding a rabbit or two to your family. If you would like to meet some fabulous rabbits or learn more about them, Triangle Rabbits will be hosting their 10th Rabbit Day at AniMall in Cary on Saturday, February 25, 10am–4pm where there will be adoptable rabbits from several rabbit rescues, educational classes, and enrichment toys for sale. Becky Lembo is a full-time rabbit enthusiast, volunteer with three local animal rescues (Triangle Rabbits, the SPCA of Wake County, and the Wake County Animal Center), and a House Rabbit Society Educator in Training. In her free time, she enjoys researching rabbit enrichment and making rabbit toys for her store Bunderland.